Carl Moell, Vatican archivist, here assembles the Pope's writings on the devotion and organizes them by major theme, for devotional reading and instruction. 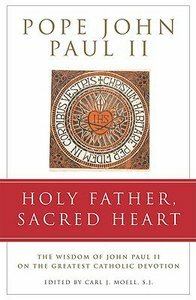 - Publisher From his earliest writings, John Paul II has had a special devotion to the mystery of the sacred heart. Carl Moell, Vatican archivist, here assembles the Pope's writings on the devotion. Arranged by major theme, these readings are excellent for daily devotional reading and instruction. About "Holy Father, Sacred Heart"